» OReGO update: How about bikes? Maybe bike computers could be rigged to report mileage so cyclists could be charged like motorists. As you may remember, state law authorizes up to 5,000 cars and light trucks under 10,000 pounds to participate in ODOT’s program of taxing vehicles by the miles they are driven on public roads within the state, instead of via the gas tax. The voluntary program started July 1, 2015, but so far only 1,005 vehicles have been signed up, OReGO spokeswoman Michelle Godfrey told me Wednesday. One of them is my 2007 GMC pickup, and it is costing the state a few pennies every time I take it out on the road. That’s because while OReGO charges me 1.5 cents per mile I drive the truck, it also refunds the gas tax that I’ve already paid at the pump. And the truck’s mileage, while decent, results in me paying slightly more than 1.5 cents per mile in gas tax. On its website, OReGO answers common questions. One of them is whether bicyclists and motorcyclists can take part in the mileage-tax program. Answer: No, only certain motor vehicles are included. But I know there’s some public interest in getting bicycle riders like me to pay more than we already pay as motor vehicle owners. So I wondered whether something like OReGO could eventually cover bikes as well. Perhaps bike computers could be adapted to report mileage to the mobile phone network the way the mileage reporting devices now do for participating cars. I am curious, how does the OReGO program work if you drive your GMC truck out of state and fuel up out of state? And, another scenario, what happens if you fill up in Medford, drive into N California, come back to Medford with a empty tank and fill up there? 1. State fuel tax paid by OReGO participants is credited to their account at Oregon’s tax rate of $0.30 per gallon, regardless of where they bought the fuel. What that means is, if a driver fuels up out of state and drives out of state, they would get a fuel tax credit (at Oregon’s rate) but the out of state miles would not be chargeable. The same scenario occurs if the driver fuels in Oregon, drives in California, and returns to Oregon to re-fuel. When enrolled in OReGO, the $0.30/gallon fuel tax is credited, and the California miles are not chargeable. Understand this is the case only for this OReGO test phase and for a relatively few number of drivers. Clearly, it is not fair for some drivers to avoid paying tax because they fuel up out of state. If OReGO moves forward, and an expanded or mandated system be put in place, there would likely be a different approach to collecting tax/road charge for these drivers. Currently, a group of states called the Western Road Usage Charge Consortium is researching the viability of a regional system that would appropriately credit state fuel tax and apply per-mile fees to the state in which the actual tax/mile occurred. Gee, it couldn’t possibly be that we don’t trust government any more at at any level. Thus we avoid involvement of any kind and with suspicion at best and usually an inclination to hostility. We know in our gut that this is another effort to add to our taxes, not to replace a tax. Good grief, our state legislature can’t even eliminate the ethanol boondoggle and it’s not only a giveaway of taxpayers money, it doesn’t even purport to accomplish its stated purpose of environmental improvement. How can we trust people like that? You probably don’t trust government because you’re a conservative that bought into all those lies about “government being the problem” and the “liberals” being after you. Your’re living in a country that has been run by Conservatives since the 1968 election of Nixon. Since the Gingrich revolution in 1994, both House of Congress have mostly been run by Republicans, including the famous Mich (The Turtle) McConnel’s famous declaration that they would pass nothing at all. For eight years. Want to get back at the people that caused this? LOOK IN THE MIRROR. Actually I don’t trust government for two primary reasons. First and foremost, is that our nation’a founders didn’t trust government and cautioned us not too as well. Second, my personal experience both as a government employee and later a business owner, taught me it is not to be trusted. 1 – The tax rate would have to reflect the actual cost of maintenance relative to that imposed by much heavier and faster vehicles. In other words, the rate would be much lower. 2 – If #1 is violated, then we can expect most of the money collected in bicycle taxes to pay for new facilities. The biggest “bang for the buck” would be small pathways connecting neighborhoods isolated from each other by cul-de-sacs, creeks, forests, railway tracks, and freeways. I’d be willing to pay a lot to fix the top 5 of these in Corvallis. Don’t know enough about Albany to say much, but a bike bridge across the Calapooia River near Pirtle or Walnut Drive SW seems useful. 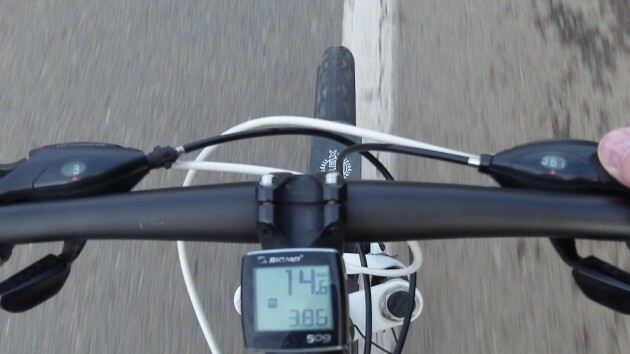 Of course, I can’t help thinking that Hasso’s bike idea is a bit tongue-in-cheek, particularly the metering methods. And if someone steals your bike, would you have to keep on paying while someone else racks up the miles? How about putting your bike in the trunk and driving across state? Do you get to pay twice? There’s just too many bugaboos trying to charge/license bikes. It would cost far more to administer than any “profits” derived. As someone who has worked rather extensively on bicycles, I doubt it would be difficult to scam THAT system. Just find an old junker bike with the “device” to register with the state while you ride your good bike.